Last month, a couple of things that had been passing through my bird-type social media circles came together in real life for me at Gemini Springs. A May 2014 article from The Slate was being passed around on Facebook. Let Kids Run Wild in the Woods is subtitled “Let Kids Run Wild, Build Forts, and Pick Flowers. Nature Can Take It.” The major theme is about how knowing about a thing (broadly speaking, the environment) leads to caring about that thing. Around the time this was being passed around my birding circles, the Wandering Herpetologist posted an article about the differences between birders and herpers. Herpers are people who are interested in amphibians and reptiles. The post points out that herpers are likely to handle herps in the wild, while birders tend to have a different attitude (for the most part, birders can’t really handle wild birds). Also around this time, Arthur and I encountered a misguided good Samaritan who wanted to help a Gopher Tortoise. The man rescued the tortoise from the middle of the road, but his plan for release left much to be desired. With these things planted in the back of my mind, I went birding at Gemini Springs on June 9th. As usual, I started my outing at the fishing pier. While looking for waders and other birds starting their day, a young man, maybe 12 years old, approached me. 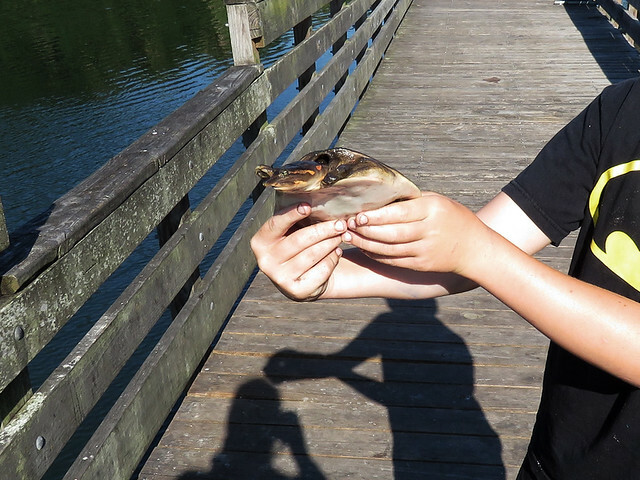 He got my attention because he wanted to show me something — a young Florida Softshell Turtle. I had only recently seen my first ever softshell at Gemini Springs. That animal was about the size of the one in the young man’s hand, perhaps the same turtle, or one from the same nest. At first I was mildly alarmed that he intended to drop the animal into the water right from the pier, a good ten-foot drop. I was quickly reassured. The young fisherman had inadvertently caught the turtle on his line. The hook safely removed, he was about to release the turtle. For some reason he decided to take a detour to show the animal to the stranger with binoculars, me, standing at the other end of the fishing pier. I was grateful. He told me about how fast these slippery animals can run, and he invited me to feel the turtle’s backside, to see why these turtles have the name they do. He obliged when I asked for a photo. I thanked the young man for the turtle lesson, truly appreciated, and watched him carefully walk around to a safe spot and gently release the turtle at the water’s edge. Whatever this young man will grow up to be, he’s already a fine naturalist and budding environmental educator. It’s pretty obvious he was allowed to actively engage his environment as he’s played in the woods. And he’s clearly on the “handle the herps” side of that fence. I am certain that as an adult he will continue to care for the natural world, and isn’t that wonderful? This entry was posted in Gemini Springs, Herps, Not Birds. Bookmark the permalink.